Charlie Adam insists Scotland's humiliating defeat to Kazakhstan should not be treated as a "sacking offence". 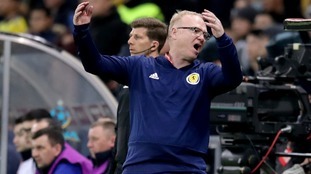 Calls for manager Alex McLeish's head have come thick and fast since the final whistle blew on one of the nation's worst ever results in Nursultan. But Adam, who played under the Scotland boss during his stint at Rangers, believes his old Ibrox mentor deserves more time after guiding the Scots to the safety net of a Nations League play-off. Instead, the Stoke midfielder says the finger of blame for Thursday's shock 3-0 loss should be pointed at the players, who collapsed without a fight against a side ranked 117th in the world at the Astana Arena. "They capitulated too easily," Adam told BBC Radio 5 Live. "It's an inexperienced group and I didn't see anyone pulling each other together. "You lose two goals quickly and need to regroup. You need to have leaders." He added: "I don't think it's a sacking offence for McLeish. He did his job by getting Scotland to the Nations League play-off.